You may find a white powdery substance on the leather upon first opening it. Don't worry. This is the natural fat of the leather, which you can swipe away with a soft cloth. Over time you can use some colorless shoepolish to keep your leather cover moist and rich. The more you use it the nicer it gets! 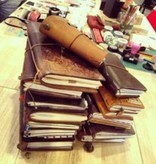 Wonderful classy brown leather notebook from Midori for writing down your ideas or for things you don't want to forget. 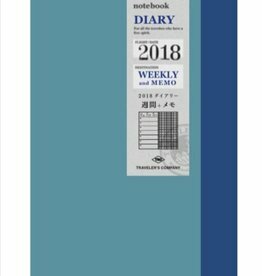 You can put together this notebook just like you want it with all the different refills! 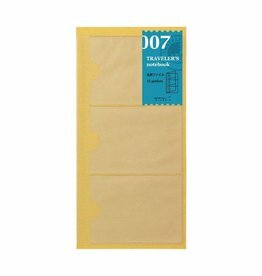 Just refill your Traveler's Notebook easily with this blank refill 003 from Midori if you're totally finished. 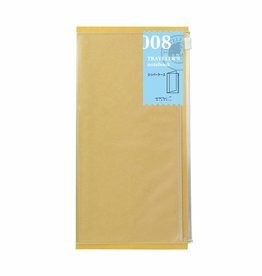 This blank refill is easily added to your notebook and perfect for sketches or other notes! A business card is easy to loose. Just easily insert this card file in your notebook and every business card will be saved!